Acids and bases are one of the most important topics in all of chemistry… and also in the fight against evil. It’s widely known that sizzling, popping vats of acid make excellent booby traps as well as providing that perfect evil-lair ambiance, so if you want to be a successful superhero, it’s vital that you understand how acids and bases work—and how to neutralize them when you make it into the enemy base. Even if you’re not a superhero, acids and bases can help you do some amazing things in real life that go beyond the old vinegar + baking soda volcano. Read on to learn about these amazing compounds! What is an acid, exactly? Acids are a group of compounds that can corrode metal, turn litmus paper red, and make things sour (in small doses—don’t go around tasting compounds to see if they’re acidic!). But how do they work? Bases are like the opposite of acids: they can accept an H+ (or donate an OH–), are bitter and slippery (like the detergent you use to wash your cape after a busy day of crime fighting), and turn litmus paper blue. They can be just as dangerous as acids when concentrated enough! If no acid is around to donate it, strong bases will take the H+ from any compound it can find, including water, leaving behind a hydroxide (OH–) ion. Some bases just dissociate into a positive ion and a hydroxide directly, like NaOH (Sodium Hydroxide) which breaks down into Na+ and OH–. If you see a compound that appears to have an extra H+ or OH–, keep an eye on it—it’s probably an acid or a base. There are actually three different definitions of acids and bases that developed over time: the Arrhenius (acids donate H+, bases donate OH–), the Brønsted-Lowry (acids donate H+, bases accept H+), and Lewis Acids (this definition focuses on electrons, but covers many of the same compounds—acids accept a pair of electrons, bases donate a pair of electrons). This post is focused on Brønsted-Lowry acids and bases, which is what we tend to think of when we call something acidic or basic. Two things make acids and bases dangerous: their strength and the kinds of reactions they do. Acids and bases can perform a couple of different reactions: precipitation reactions and dissociation reactions. Most acids and bases are inert (unreactive) until you put them in water. But once they mix with water, they “dissociate” or break down into their component parts. That means something like Hydrochloric Acid (HCl) will dissociate into a Hydrogen ion (H+) and a Chloride ion (Cl–), and a base like Sodium Hydroxide NaOH will dissociate into Na+ and OH–. Another way to write this is to include the water in the reaction. Water is made up of two hydrogens and one oxygen: H2O. Water is special because it can both donate a hydrogen to become OH– and accept one to become H3O+. What makes these reactions dangerous is how quickly they can happen—and the fact that many of them produce heat when the compounds dissolve (they are “exothermic”). That can cause the liquid to boil, potentially spattering it on your skin or clothes—where it will react with whatever it lands on. If acids and bases are added directly to each other, they form a salt of some kind as well as pure water, neutralizing their acidic and basic properties and rendering them unreactive. Acids and bases are most dangerous when they are very, very concentrated. This is determined by calculating their pH a scale that runs from 1 (very acidic) to 14 (very basic). 7 is neutral and is the pH of pure water. When there are lots of H+ ions, the solution will be very strongly acidic, and the pH will be low. 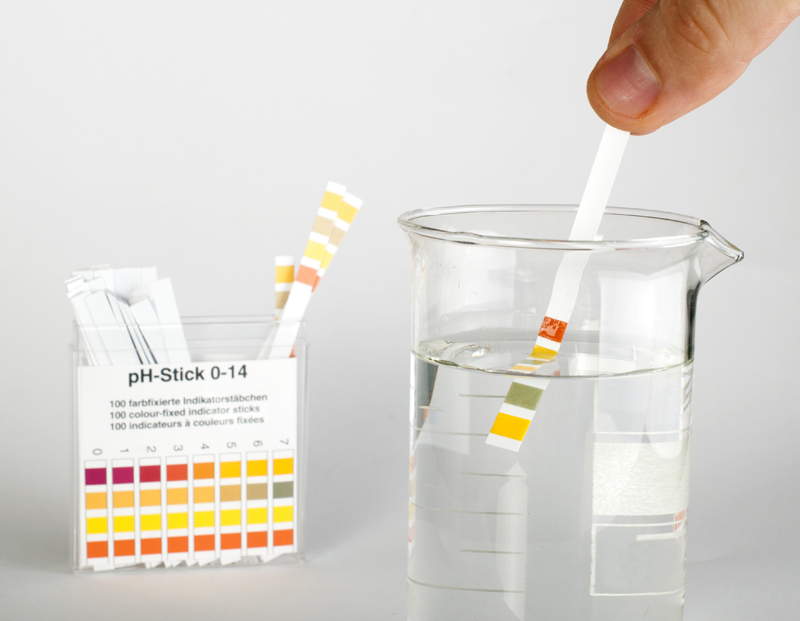 If there are very few H+ ions, the pH will be high, and the solution will be basic. Strong acids and bases are desperate to react, so they react very quickly, which can produce in a lot of heat (exothermic reactions). In order to stay safe around them, it’s important to dilute them (unless you need them concentrated for an experiment). But when you dilute them, you have to be very careful, because acids and bases break down when water is added, which is what creates the heat. So if you’re faced with a giant vat of acid blocking your way, how do you dilute it safely if you don’t have a base lying around to neutralize it? Can you just dump a bunch of water on top of it until it’s diluted enough to be safe? Actually, that’s a really bad idea, even though it makes sense at first. When we dilute something (say, lemon juice to make lemonade), normally, we just add water. But when working with very strong acids, adding water directly to the acid can be very dangerous. The water will react very quickly, sometimes releasing enough energy to boil the solution… and destroying any hope you might have of stopping the super villain before he puts his evil plan into play. Instead, the key is to prepare the necessary amount of water to achieve the dilution you need for your experiment in a separate vat (or two, or three) large enough to hold both the acid and the water. Then (while wearing safety goggles), slowly transfer the acid into the water, being careful to keep your face away from the reaction. This way, at any given point, the acid will be fairly diluted and poses a lower risk to your health and safety! If you have trouble remembering which one gets added first, think about the concentration. You want to keep the solution as dilute as possible. Adding a tiny amount of water to a big beaker of acid will result in a very strong, concentrated solution, and that means danger. But adding a tiny amount of acid to a big beaker of water will make a weak, dilute solution, which is much safer. Now that you know how to get around those pesky acid traps, even if you don’t have hundreds of pounds of baking soda on hand to neutralize them, you’ll be well on your way to stopping whatever evil plan your arch-nemesis has in store. For more on these reactions and ways to calculate how many grams of salt will be precipitated, or how many grams of acid/base are needed to produce a particular amount of different salts, check out this Acids & Bases video lesson with Professor Raffi Hovasapien.